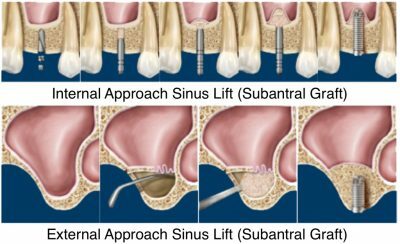 In the most common sinus augmentation technique, a tiny incision is made near the upper premolar or molar region to expose the jawbone. A small opening is cut into the bone and the membrane lining the sinus on the other side of the opening is gently pushed upward. The underlying space is filled with bone graft material and the incision is closed. The bone which is used for this procedure may be from your own body or Dr. Dean may use synthetic materials which can also stimulate bone formation. The implants are placed after healing has occurred; this will depend on the individual case. Sinus augmentation has been shown to increase the success of dental implant procedures.